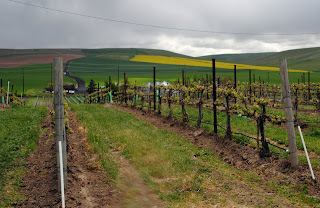 What follows is a section of my 2010 Walla Walla Spring Release Report. The report will be published in its entirety in .pdf form after the last entry is posted to the blog. Spring Release, always the first weekend in May, is one of the main event weekends in the Walla Walla Valley. Although I have traveled to the valley for this event for many years, several things particularly struck me on this visit. The first was the consistently high quality of the wines being made. It seems every year the quality bar gets raised higher and higher as wineries gain additional experience and competition increases. No doubt coming off exceptional vintages in 2007 and 2008 also has something to do with this. The second was the continuing influx of new wineries. The valley now is home to over one hundred wineries. Numerous wineries were opening their doors for the first time Spring Release Weekend. While this might seem at first blush to defy the poor economy, running a winery, as I always say, is like steering the Titanic. Everything moves very slowly. All of the wineries opening on Spring Release Weekend were started well before the economy took such a perilous turn. I was also struck by the number of people I saw walking out of wineries not with bagged bottles of wine but rather with case boxes. In fact, numerous wineries I spoke with reported increased sales compared to the previous year, a possible sign that the economy – at least in terms of wine sales - is rebounding. As usual, I visited a number of new wineries or wineries that I had not visited before. New wineries included Don Carlo Vineyard, Locati Cellars, Riverhaven Cellars, Sinclair Estate Vineyards, and Tero Estates. Don Carlo Vineyard is a new winery started by Lori and Tim Kennedy. In Tim’s previous life, he started the omnipresent brand Tim’s Cascade Style Potato Chips. If he brings any of the moxie to the wine business that he brought to the chip business, watch out world. Locati Cellars focuses on Italian varietals. The tasting room is located in The Depot building right off Highway 12. Riverhaven Cellars is a new winery that uses Riverrock Vineyards in The Rocks area of Walla Walla Valley for its estate fruit. Sinclair Estate Vineyards is a new winery that just opened their doors for Spring Release weekend. The tasting room is located in downtown Walla Walla. The winery has plans for an estate vineyard, which are painted along the wall of the tasting room. 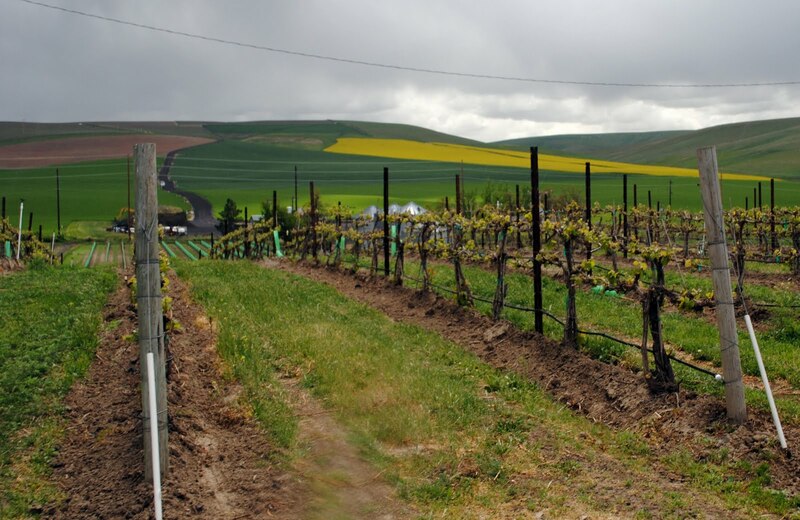 Tero Estates is located on the Oregon side of the Walla Walla Valley AVA. The winery has a beautiful new building with breathtaking views of the surrounding estate vineyard, Windrow. Tero Estates has partnered with Ashley Trout of Flying Trout Wines who was also pouring her wines on this weekend. In addition to these new wineries, I visited a winery I had not gone to before, Bunchgrass Winery. Bunchgrass has seen a recent revival and has an excellent new set of releases. Other wineries I visited during the trip included Abeja, Beresan Winery, Corliss Estates, Gramercy Cellars, K Vintners, L’Ecole No. 41, Otis Kenyon, Rotie Cellars, Saviah Cellars, Sleight of Hand, Trust Cellars, Va Piano Vineyards, Walla Walla Vintners, and Waters Winery. While the quality at each of these wineries was impressively high, I was particularly struck by both Waters and Sleight of Hand which were offering their finest releases to date. Look for information on each of these wineries as well as tasting notes on the wines in the coming days. Sean, seriously...over 100 wines in one weekend? I don't think you are any different than any other wine gusher, but c'mon, is what you accomplished (with a numbers game) truly the way to enjoy wine? What happened to the joy of witnessing the evolution of a well-made wine over the course of a few hours, with and without food? WWM, mercifully this took place over the course of four days. Believe me, I would much rather sample a wine over a few hours or days but this is, unfortunately, not always possible. And power sampling is truly *not* the way to enjoy a wine but rather a way to evaluate it. Thanks for the comment! First, just found your website and wanted to thank you for your efforts! Being a resident of the Willamette Valley, we've become tired of being priced out of the Oregon Pinot experience, and discovered Walla Walla last year. This year was our first Spring Release weekend, and we couldn't have had a better experience. As you mentioned, the quality is amazing, and the atmosphere in Walla Walla, even better. We attended the Waters wine dinner on Friday night, and Jamie's wines were amazing. The only challenge we found during our stay was the fact that there were too many great wineries to visit and not enough time to experience them all. With any luck, your efforts here will help to plan the next trip to Walla Walla. In the meantime, it's off to Woodinville to experience the incredible wines at Efeste. Jsco, glad to hear you found the site. Indeed, the most difficult part of visiting Walla Walla is that there are just so many wineries to choose from. A good reason to keep going back! Enjoy Efeste. I'm a big fan of the current release of their Jolie Bouche Syrah. Thanks for the comment! Sean, just now seeing this, and wanted to say first off, it was great seeing you the past few days in Seattle. I thought the Rose' event was a blast, even though I could only stay for a short while. The"New" Media really will have an impact on how wine is sold, and this type of tasting/reviewing wines certainly will become the norm as opposed to something novel. Hi Trey, Good to see you in Seattle as well. Let's see try to set something up around WBC. I'll pop you an email.